This morning we awoke to the sound of the Fiji Aggressor’s twin diesel engines warming up to move us out of the lagoon and take us just off-shore of Makogai Island. It was a truly beautiful sunrise and the waters were as clam and flat as a sheet of glass. The crossing last night had gone smoothly and with any luck we would finish out our week of diving with the same excellent weather we’ve experienced so far. We would have to make our bottom times shorter today, on our third and fourth dives, so as to have enough time to prepare for our shore visit to the village on Makogai Island this evening. More on the village visit later! Our first dive was on ‘Rick’s Place’ and it was an Awesome Dive! The word “WOW” comes to mind, but just doesn’t seem to do it the justice it deserves! It must have been the early morning lighting that made it so special for me. 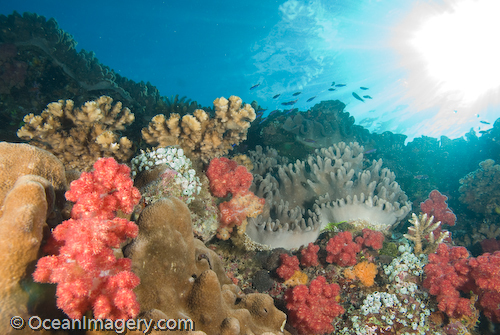 The way it shimmered on the surface and made the soft corals just come alive with color was truly amazing. The beautiful sea fans were also a treat as they swayed in the slight surge of the oceans current. 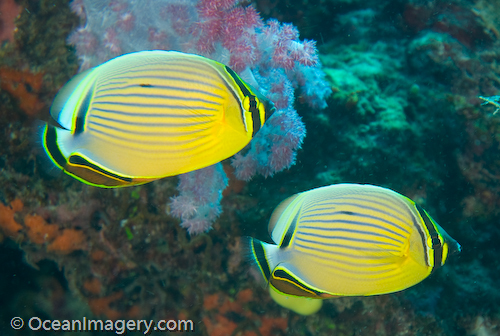 This is what a healthy coral reef should look like… a true underwater photographer’s dream site! The top 30 feet of these two pinnacles are covered by the most incredible coral gardens which are home to Lion Fish, Leaf Scorpion Fish, White Tips, Painted Cray Fish, Hump Head Cleaner Shrimp and a vast amount of bubble coral. Nice Dive!! Next up was ‘Becky’s’! This was another pinnacle dive, but this site had a very interesting and large swim through which was adorned with tones of beautiful sea fans. The entrance is at about 80 feet and as you swim up through the pinnacle you eventually exit on the other side at around 40 feet. I bumped into a large Oreo Grouper as I was making my way up the coral shaft… I don’t know who was more surprised, the Grouper or myself! 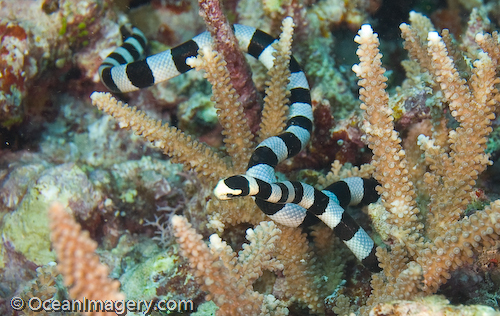 Also on this site we got to see the elusive Blue Ribbon Eel, Lion Fish, Nudibranchs, Morays and even a large Banded Sea Snake which I chased around until I was rewarded with a couple of good photos. There was absolutely no current today and it looked like our next two dives would be the same way. We finished off the diving day on ‘PinBall’ and then ‘Dominoes’, two sites that have been named for the number and layout of pinnacles on each. There was absolutely no current on either one of these dives but the visibility was slightly lower due to a shallower depth range and a sandy bottom. 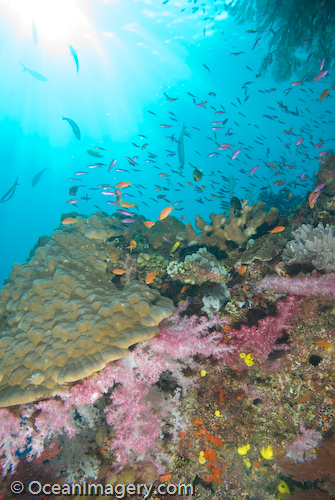 Both dives were still a lot of fun and as usual the tops of the pinnacles were covered in colorful soft corals. 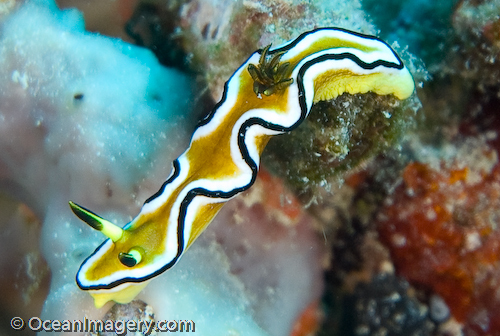 Along with the many Reef Fish we also encountered a baby Octopus, Scorpion Fish, Nudibranch, a Sea Snake and a curious White Tip. « Our last two dives in Namena!